Ita��s intriguing that online shopping has come of age in India, to the extent that people are willing to spend big bucks for designer wear online without batting an eye or wanting a trial. As online portals bloom and the consumer is spoilt for choice, it behoves understanding the thought process behind our new-age interest in buying haute couture at the click of a mouse. Not a kilo of tomatoes, but a designer ensemble worth `30,000, perhaps. As designers have discovered online sales success, websites like the designer-centric apparel portal exclusively.com are now well-established. Exclusively.com now boasts a gaggle of big name designers, showcasing their signature styles. From Shantanu & Nikhil to Rohit Gandhi and Rahul Khanna, Falguni and Shane Peacock, Krishna Mehta, Zubair Kirmani and others, you can find sarees, ethnic and Western ensembles, embellished jackets, kurtas and wedding wear. 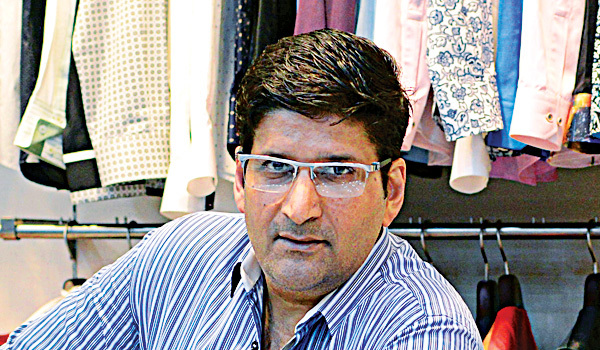 A new entrant is menswear specialist, Paresh Lamba who has been dressing Bengaluru society the last 20 years. I dropped by at his large office-showroom, where it was clear that there are still plenty of people who want to chat and choose, touch and feel before they buy. So why go the online route? I asked. a�?This is the future,a�? he says, a�?Everything we order is via an app nowadays. The convenience of shopping at a click is exciting, and ita��s a huge market. People are busier than ever, so why visit a store when you can find a website and shop online?a�? Therea��s also the advantage of reaching a large consumer base outside metro cities: smaller towns teeming with youngsters who are no less aspirational than big city spenders. a�?Technology has reached everywhere a�� everyone today can access the Internet, see whata��s in style. They are ambitious. You see this most during weddings. You know, Indian designers survive on weddings, business-wise,a�? he tells me. Lambaa��s online range, priced from `7000 to `30,000 will include jackets, bandis, shirts, kurtas and other signature designs. So what trends has he observed during his decades in mena��s fashion, I ask. a�?Men have become more flamboyant, fashion conscious, pay attention to design, and particularly colour. They are realising that just one style of shirt wona��t fit all seven days of the week and every event theya��re invited to.a�? Cities like Bengaluru and Hyderabad are particularly cosmopolitan cities. a�?Therea��s an eclectic mix of people to be found here from all over the country, even the world. Influences are varied as are backgrounds. And so much depends on appearance these days,a�? he says, adding, a�?A well-groomed, well-dressed man strikes confidence at the first business meeting. A shabby, ill-dressed guy might have you thinking: if he cana��t look after himself, how can he be trusted with my business? Today, impressions are created in the first 15 minutes of meeting a person. So you need to present yourself well.a�? Shakespeare said it best after all, clothes do make the man.